A tender yet resilient, bulbous geophyte, with an unconventional yet strikingly attractive appearance, favoured by many as a hardy indoor and shade plant. It is most loved for its ability to survive, and even thrive under conditions of extreme neglect, and has captured the attention and admiration of horticulturalists worldwide. 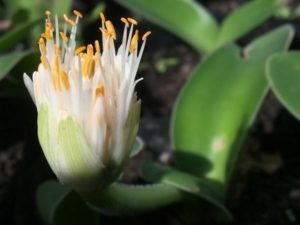 It is one of the select few evergreen Haemanthus species and can have a rather varied appearance depending on its individual surroundings. The thickset, succulent, strap-like leaves vary in colour from light to dark greyish-green, and often have a lovely rosy-pink glow and a layer of fine yellow dots, especially when young. 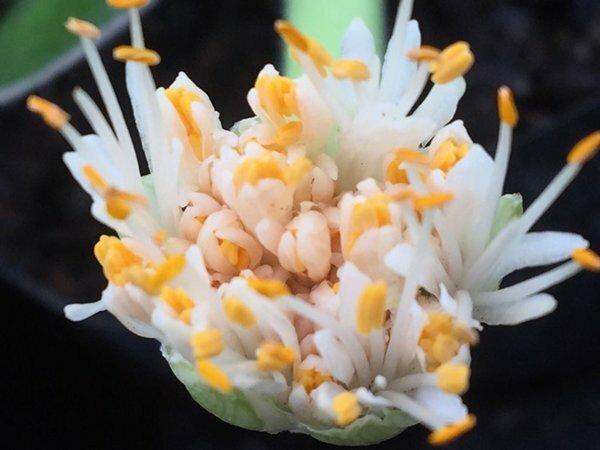 Held above the leaves is a curious, compact, tufted, bristly greenish-white flowerhead, consisting of multitudinous amber-tipped, pollen rich anthers. These peculiar flowers are succeeded by bunches of dainty vermilion berries. A highly adaptable species, and the only of its genus that grows in both summer and winter rainfall regions of South Africa. It has a very wide distribution across our country, but is most common along the coastlines, from the southern Eastern and Western Cape, through to Natal. It prefers shady habitats and can most often be found in the understorey of forests, shady areas in bushveld, rocky outcrops in river valleys and on some high-altitude mountain ranges. It is able to tolerate harsh coastal environments and can often be encountered growing on sand dunes and rocky seaside areas. The leaves are broadly ovoid to almost strap-shaped (80-400 x 20-115 mm), with smooth to slightly fuzzy or ciliated margins that taper to sharp or blunted tips. They typically have smooth, shiny surfaces, but can sometimes have a layer of short, soft, downy hairs. The leaves vary in colour from pale to dark or greyish-green and may have a scattering of white or pale-yellow spots on the upper surfaces. Each bulb produces only two oppositely held, new leaves per year, and a single plant may sometimes be seen with three or more leaves. The leaves either lay flat on the ground or are held erect and can be very variable with regards to shape and size. The broad, ovoid bulb (60-80 mm wide), which grows on the surface of the ground, is often semi- exposed and bright green where it is exposed to bright sunlight. Thick, fleshy roots can be seen spreading out laterally over the area surrounding the plant. Tight, conical to widely ovoid, brush-like umbels (20-75 mm wide), held on a stout, sturdy and fleshy stem (300-350 x 10-14 mm). Each inflorescence consists of multiple, condensed, conspicuously protruding, small white flowers (20-25 mm), each tipped with a yellow or orange anther. The masses of ovate-rounded stamens are held erect within broad, white, green-veined bracts. 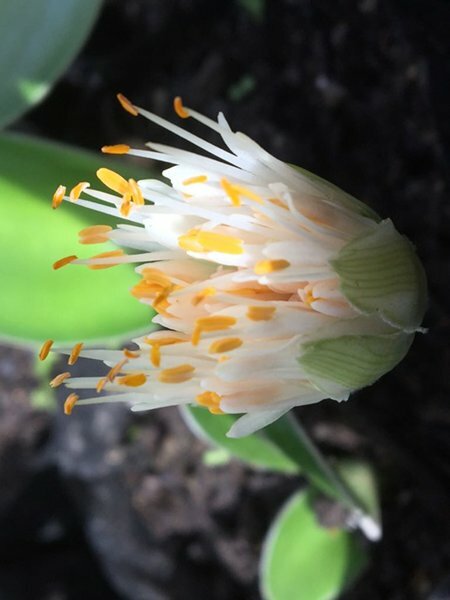 The flowering period is often sporadic but lasts for a long time, and each bulb typically produces only one new flower per season. The main blooming period generally occurs from late autumn to winter. Dense clusters of fleshy, pea sized (8-10 mm), oval berries. 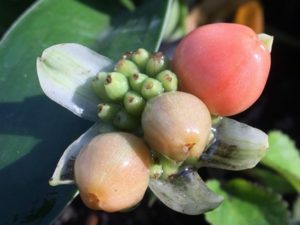 Each berry is three-celled, containing one translucent seed per cell, and ripens to a bright orange or scarlet (occasionally white). They have a distinct musky odour. 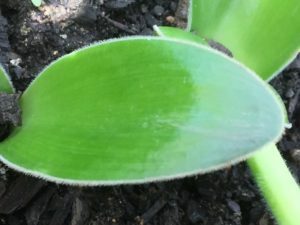 100-200 mm, often clump forming. 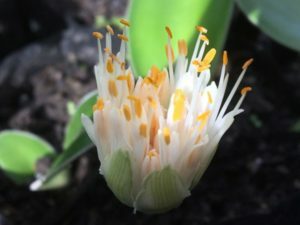 Not many medicinal uses have been chronicled, but preparations of different parts, mostly of the bulb and roots, are said to provide relief from persistent coughs. It has also been used in traditional folklore as a protective charm to ward off lightning. Parts of the plant are considered to be poisonous due to the presence of several toxic alkaloids. If ingested, it may cause severe discomfort, and it is also a skin irritant. Cases if poisoning are rare, but care should still be taken when handling. The flowers lure insects, bees and butterflies, which may lure the occasional insect-eating bird, and the brightly coloured, fleshy berries are irresistible to seed and fruit eating bird species. A very popular choice amongst gardeners and landscapers, loved for its hardy and adaptable nature, ornamental properties and ease of cultivation. It is one of the few species of its genus that is evergreen, and the beautiful, striking flowers last for a long time, adding splendour and interest to its surroundings for many weeks. H. albiflos is able to flourish even if neglected (prefers to be left completely undisturbed once established) and grows very well in a container. Even when the roots are heavily restricted (it seems to prefer this), it still thrives and produces stunning flowers. 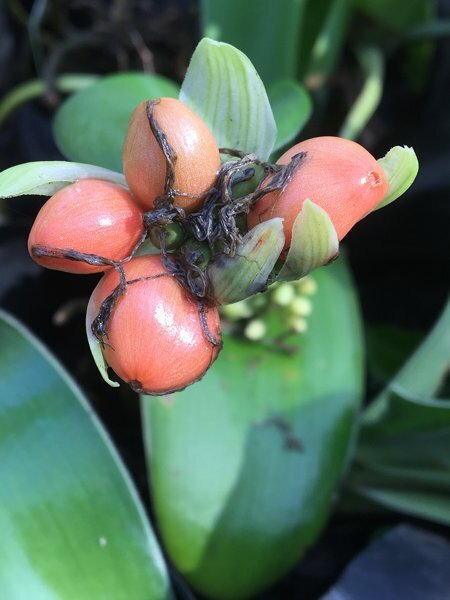 It is the perfect indoor plant and adds life and vibrancy to otherwise bland shady areas. 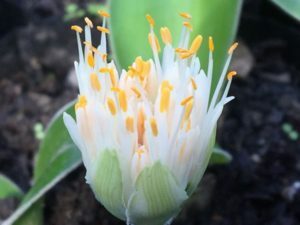 It can tolerate sandy soils, and is a good choice for difficult coastal gardens, as it will withstand the relentless onslaught of strong, salt-laden coastal winds. This easy-going bulbous perennial makes a good groundcover, and can cover large, bare patches of soil quite easily due to its clump-forming abilities. Helps control erosion and stabilise soil. Lastly, it has something special to offer in nearly every season, from its handsome, lush foliage, to its eye-catching floral display and striking, colourful, almost luminescent fruits. H. albiflos is drought resistant, as it has the ability to store moisture in its roots. It can therefore survive the occasional dry spell without too much damage. 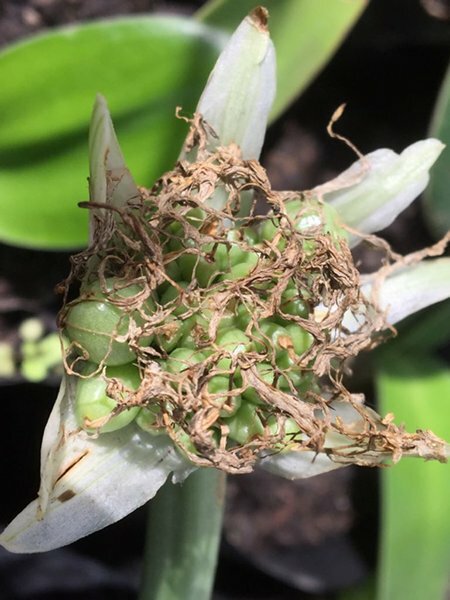 The plants are moderately frost hardy, and are able to endure sporadic, mild frosts, but extended periods of freezingly low temperatures can cause severe damage or even kill them. Frost hardy to about -2°, but with adequate protection, may survive through even lower temperatures. They are tolerant of heavy salt-laden coastal winds and can grow even in very sandy soils. The plants reach maturity at about 2-5 years, depending on individual conditions. 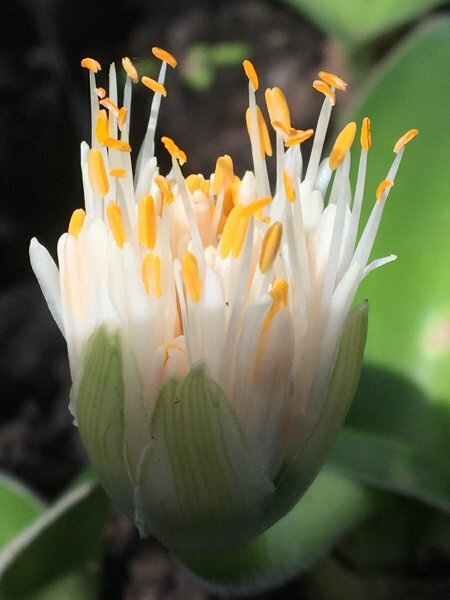 It prefers light, semi-shade and will even grow and bloom in heavy shade. 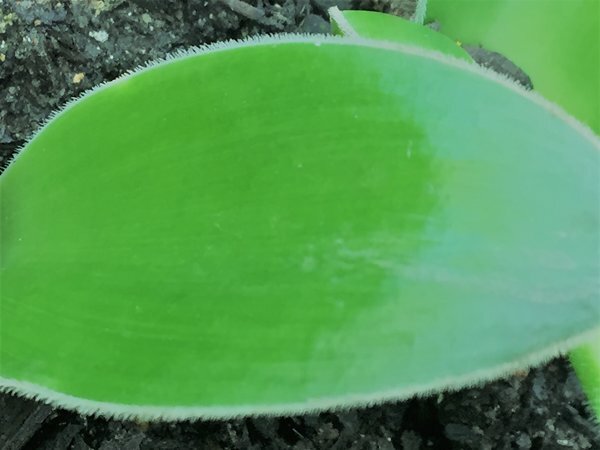 Excessively bright conditions may result in leaf burn and give the plants a chlorotic appearance. grows best in bright, but somewhat shaded conditions – it does not grow best in full sun. It needs a very well-drained, moderately fertile soil, with a slightly acidic to neutral ph. They are tolerant of sandy soils. the plants enjoy moisture throughout the year, but more during the active summer growing period. They can be given a deep drenching at least once or twice per week but reduce watering in winter to about once every two weeks. They are very tolerant of under-watering. They can be grown from either seed or offsets, but the latter is the most commonly used and effective method. 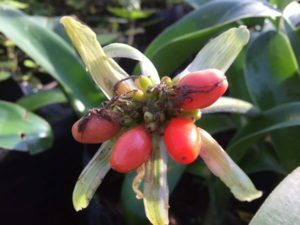 If the plat is grown indoors, it will often not produce berries. 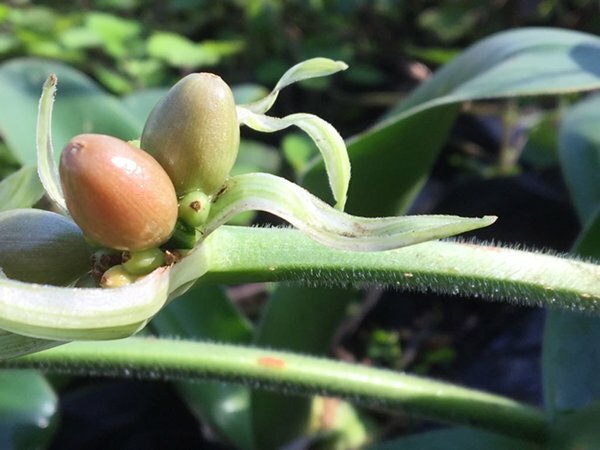 Once the flowering period is over, offsets or adventitious buds, with some roots, can be carefully removed from the parent plant. It is best to harvest and separate buds from well-established, thick clumps in early spring, ensuring that each offset has a decent number of roots. Replant them as quickly as possible, preferably in a more shaded area until the bulbs have established themselves and formed supplementary roots. Use a loam-based, well-drained medium, and plant the bulbs with the upper half exposed. If growing from seed, sow them in a mixture of washed river sand and compost. Do not cover the seeds with extra soil, but lightly press them into the soil, only a few mm’s deep. Keep in a warm, bright area, and mist the soil every so often, but do not let it become waterlogged. Germination may be erratic, and seeds can take several months to germinate. Seedlings are very slow to mature, and it may take several months for their first true leaves to appear above ground. The new plants should be left in their respective trays for at least two years. At about their third season, they can carefully be transplanted into their new parament homes. they may take at least several years to reach flowering size, but offsets may flower in their first year under ideal conditions.